Durable dinos hold two hard shell tacos until you make them extinct. Known for their hard shells and spicy dispositions, dinosaurs roamed the earth millions of years ago. These taco-toting beasts are back for a blast of mealtime fun. 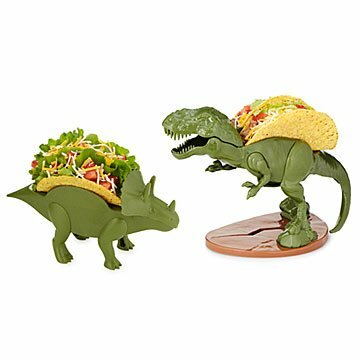 The durable, dishwasher-safe triceratops and t-rex hold two hard shell tacos until you make them extinct. Made in China. Holds 2 hard shell tacos. My niece & nephew thought these were the coolest gifts and were begging to have tacos ASAP. Made my grandson smile....what more could I ask for! These Dino's were a fun gift for a family taco dinner. Cute idea that kids will LOVE! Great idea for kids that can mix fun with eating. Perfect from kids to best friends that love tacos and dinosaurs. Hope they make a dragon because our favorite book is Dragons Love Tacos! I'm not sure how often he'll use this as it is a novelty gift, but it still looks cute sitting in a kitchen reguardless!